Dr. Amit K. Tanwer is a Professor & HOD of Mechanical Engineering of Roorkee Institute of Technology, Roorkee. Dr. Tanwer has more than fourteen years of Academic and Industrial experience. Dr. Tanwer completed his B.E. in Mechanical Engineering then completed M.E. (Mechanical) and Ph.D. on the topic of Development of Environmental management system model for Indian manufacturing industries from PEC University of Technology, Chandigarh. Dr. Tanwer is author of more than 20 research papers in national and international reputed journals and conferences on Fibre composites, Heat treatment and material properties of various steels, Arc welding, Friction stir welding, Al alloy castings, Green manufacturing (GM), Environmental management system (EMS) and Green supply chain management (GSCM). Dr. Tanwer guided dissertation of 15 M.Tech. students and has fellowship of Indian Society Mechanical Engineers (ISME), Chennai. 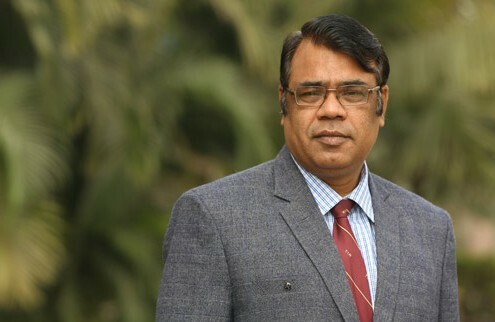 Dr.Tanwer is life member of various reputed national and international professional bodies as Associate member of Institution of Engineers (AMIE), Kolkata and Indian Society for Technical Education (LMISTE), New Delhi. Dr. Tanwer is associate member of Institute of Research Engineers and Doctors (the IRED), New York, USA from Oct 27, 2014. Dr. Tanwer is member of Society of Automobile Engineering (Chennai) and Coordinator of RIT student chapter for Mechanical Engineering. Dr. Tanwer is Nodal officer for the institute for All India Survey in Higher Education (AISHE), Ministry of Human Resources and Development (MHRD), Govt. of India from 2011 and is Nodal officer for National Institutional Ranking framework (NIRF), MHRD, Govt. of India. Dr. Tanwer has life membership of Scientist and Engineers wing (SEW), Rajyoga Education and Research foundation , Mt. Abu, Rajasthan. Dr. Tanwer organized various conferences, workshops, Technical Seminars, Guest Lectures and Industrial Visits for the students of the institute. And attended many short term courses at IIT (Roorkee), PEC (Chandigarh), BITS Pilani etc. Welcome to the Roorkee Institute of Technology, at Roorkee, Uttarakhand, a diverse and vibrant community dedicated to discovery, to making knowledge matter, and to developing all of its members to their utmost potential. In addition, we face the ongoing challenge of enhancing our practices and approaches so that they are effective and efficient, with students as the central point. Changes have been initiated by the addition of some new faces and by staff assuming new duties, but within a context of continuity since our objective remains the same to provide best support we can for students to succeed by giving them the opportunity to achieve their full potential. Our student’s success has always been and will remain our main focus. More than ever, Roorkee Institute of technology seeks to develop student leadership. We are beginning this new chapter with confidence, optimism and idealism. I take this opportunity to welcome you all at Roorkee Institute of Technology. I can't think of a better place to live and learn. On this website you can read about and hear from our faculty and students, and you can learn about the Core Curriculum that brings the technology together, as well as about our departments, majors, minors, pre-professional and co-curricular programs, which shape our collective lives. There are amazing opportunities in store at the College, from intense Freshman Seminars, to research experiences, community engagement, intensive internships in Roorkee City, and access to the first truly college. Welcome to the feast!